Paula Amad is Associate Professor of Film Studies and Chair of the Department of Cinematic Arts, University of Iowa. She is the author of Counter-Archive: Film, the Everyday and Albert Kahn’s Archives de la Planète (Columbia University Press, 2010) and numerous articles, in, amongst other journals, Representations, Camera Obscura, History of Photography, Cinema Journal, Film History, and Framework. She is currently writing a book focused on an alternative history of modern aerial vision across photography and film. Her awards include a J. Paul Getty Postdoctoral Research Fellowship (2006-7), an International Grant for Philosophy and Photography Research, awarded by The Shpilman Institute for Photography (2011), and the 2014 Katherine Singer Kovács Award for Outstanding Essay by the Society for Cinema and Media Studies for her article in Cinema Journal titled “Visual Riposte: Looking Back at the Return of the Gaze as Postcolonial Theory’s Gift to Film Studies.” Her essay published in the Spring 2015 issue of Representations, titled “Film as the ‘skin of History’: André Bazin and the Specter of the Archive and Death in Nicole Védrès’s Paris 1900 (1947),” presents work related to her third projected book on the topic of the archival imaginary in post-war French cinema and post-civil war Lebanese cinema. Amy Chen is the English and American Literature Librarian in the University Libraries and a contributing editor at Archive Journal. Dr. Chen researches in the field of literary collection acquisition and special collections pedagogy. Her book, Archival Bodies: The American Literary Collections Market since 1944, is forthcoming from a university press. Her two open educational resource games, Codex Conquest and Mark, use play to teach early modern book history. Matthew Hannah is a Mellon postdoctoral fellow at the Obermann Center. He earned his PhD from the University of Oregon in June 2015. He studies Anglo-American modernism, twentieth-century literature, and digital humanities. His dissertation, Networks of Modernism: Toward a Theory of Cultural Production, analyzes modernism as the product of diffuse transatlantic interactions among individuals. Teresa Mangum is a professor with appointments in Gender, Women’s, and Sexuality Studies; English, and the Public Policy Center and the Director of the Obermann Center for Advanced Studies. She is the author of Married, Middle-brow, and Militant: Sarah Grand and the New Woman Novel (1998); editor of A Cultural History of Women: Volume 5: The Age of Empire, 1800-1920 (Berg 2013); and guest editor of special issues of Philological Quarterly, Nineteenth-Century Contexts, Victorian Periodicals Review, and the Journal of Aging Studies, including a forthcoming special issue of PUBLIC: A Journal of Imagining America on “Digital Engagements.” With Anne Valk of Williams College, she co-edits the book series Humanities and Public Life for the University of Iowa Press. She has published numerous articles and book chapters on the ways that nineteenth-century British novels shaped readers’ understanding of women, of late life, and of connections between humans and other animals. She also publishes on current issues: publicly engaged pedagogy, the place of service in an academic career, and graduate student placement. Jennifer Sessions is Associate Professor and Director of Graduate Studies in the Department of History. Her research interests center on the relationship between France and its overseas empire, and on the intersections of culture and politics. Her recent book, By Sword and Plow: France and the Conquest of Algeria (Cornell University Press, 2011), uses archival, visual, and literary sources to trace the foundation of the French settler colony in Algeria in the mid-nineteenth century. Listen to a New Books in History podcast interview regarding this book here. She is currently at work on two projects exploring settler practices of commemoration in colonial Algeria and the 1901 “Margueritte Revolt” and subsequent trial of the accused Algerian participants. Miriam Thaggert is Associate Professor in the Department of English with joint appointments in the Department of Gender, Women’s and Sexuality Studies and the Program in African American Studies. She teaches courses on American and African American literature in the 19th, 20th, and 21stcenturies. Her book, Images of Black Modernism: Verbal and Visual Strategies of the Harlem Renaissance (Amherst: University of Massachusetts Press, 2010) studies an early form of black American modernism, one that is characterized by a heightened attention to and experimentation with visual and verbal techniques for narrating and representing blackness. The book is interested in not only in the ways in which the biological, physiological facts of visual difference have been transformed into moral, intellectual, or social hierarchies, but also, and more significantly, the impact this transformation has had on our language and the ways we talk about race and (American) modernism. Her current book project, Riding Jane Crow: African American Women and the Railroad, is a social and literary history of black women and the American train experience. She investigates the large archive that exists on and of the railroad in American culture and that archive’s notable absence of women of color. The UI’s Obermann Center for Advanced Studies serves the research mission of the University of Iowa. The Center is a convening space dedicated to debate and discovery. Its grants for University of Iowa artists and researchers support imaginative collaborations and multi-disciplinary exploration. Its programming connects scholars across campus and engages the larger public in the ambitious, illuminating, and transformative work of the artists and scholars it serves. 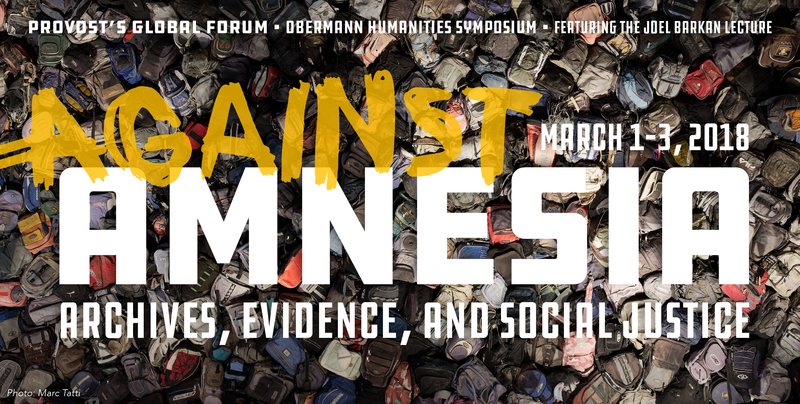 The purpose of the annual Obermann Humanities Symposium is to explore an important humanities topic that highlights UI scholars and scholarship and includes both UI and visiting participants. Recent symposia have explored the role of the humanities in understanding and communicating the new age known as the Anthropocene, celebrating and forming a cohesive vision for the study of Latinos in the Midwest, and an examination of Don Quixote as one of literature’s most famous exemplars of parody and plagiarism. University of Iowa International Programs provides leadership and support for internationally-oriented teaching, research, creative work and community engagement. helping create a community and society responsive to the increasingly global needs and obligations of citizenship. The Provost’s Global Forum is the premier annual event on campus focused on international and global issues. The forum brings together experts from the faculty and leading voices from a variety of areas (business, technology, education, politics, and civil society, including projects focused on the environment, human rights, development, citizen diplomacy) to raise awareness about and contribute to debate on the foremost issues in globalization that face us today. In addition to serving the University of Iowa community broadly, the forum endeavors to build connections between the University and the state of Iowa, and positions the UI as a national node in discussions of global affairs. The organizer(s) and topic of the annual forum are selected by the provost upon the recommendation of a committee selected by the associate provost and dean of International Programs. The forum also includes the Joel Barkan Memorial Lecture.